Evolv Supplements Beta Alanine supports increased muscle endurance and delays muscle fatigue. It can help you run / cycle / swim further, get more reps out of each set & power past your opposition on the field. Beta Alanine is a naturally occurring beta amino acid & supplementing Beta Alanine has shown to increase muscle carnosine levels, which buffer against lactic acid and prevents muscle fatigue. It is commonly found in most pre workout formulas as it is so well known for such powerful results. Its safe for men and women and a tingling sensation is often noticed soon after taking Beta Alanine which is normal and harmless. Stimulant free Pre Workout so it's a great option for people who are sensitive to stims. Best results are typically seen after a few weeks but you should notice the effects from the first serve. 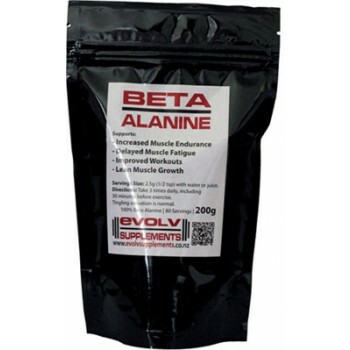 - Evolv Supplements Beta Alanine is 100% Beta Alanine with no fillers. Beta Alanine also stacks well with creatine. Servings Size: 2.5g or a slightly heaped teaspoon, mixed with about 250ml of water or your protein shake. Directions: Beta Alanine is best taken 30 minutes Pre Workout, but also recommended to take a total of 3 servings daily. # A tingling sensation is normal but doesn't happen every time / to everyone.